Survivor: Redemption Island (2011) - 10th place, 9th out - 3rd juror. Voted out in Episode 11, "A Mystery Package" (Day 30). Eliminated (in a duel) in Episode 12, "You Mangled My Nets" (Day 31). Cumulative totals: In-game - 30 days; Redemption Island - 1 day. Redemption Island Ep.1 RC/IC: "Push It Uphill" - Pushes blocks, and Zapatera wins! Redemption Island Ep.2 RC/IC: "Smash, Grab, Smash" - Grabs a key for Zapatera, and Zapatera wins again. Redemption Island Ep.3 RC/IC: "Spin Cycle" - After David throws the puzzle, Zapatera "loses." Redemption Island Ep.4 RC/IC: "Toolin' Around" - Crowbars, chops ropes, and hammers tiles, and Zapatera wins! 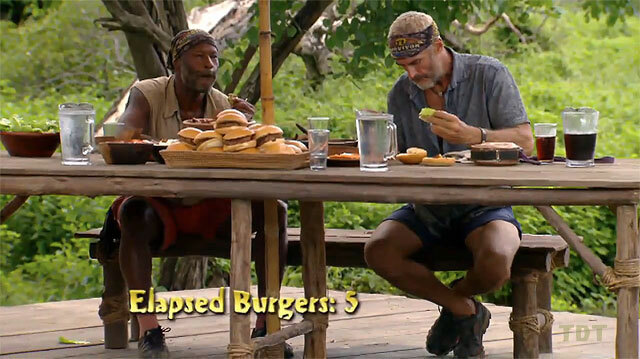 Redemption Island Ep.5 RC/IC: "Smoko" - Blindfolded, follows Stephanie's orders, Zapatera loses. Redemption Island Ep.6 RC/IC: "Beach Balls"- Matches up against Ashley, makes no catches; Zapatera loses. Redemption Island Ep.7 RC/IC: "Crash Course"- Goes through the obstacles, but Zapatera loses to Grant again. Redemption Island Ep. 8 IC: "Rollerballs" - Tenth person out, in the three-ball phase (3rd/12). Redemption Island Ep. 9 (F11) IC: "Meso Soup" - Just misses the second round (tie-7th/11). Redemption Island Ep. 9 (F10) IC: "Gang Hang" - With Phillip, opts to sit out and eat, not compete (tie-10th/10). Redemption Island Ep. 10 IC: "Mayan Pizza"- Makes it to the second round, finishes barely behind Rob (2nd/9). Redemption Island Ep. 11 (F8) IC: "Log Jam" - Loses to Ralph in the first round (tie-5th/8). Redemption Island Ep. 11 (F7) IC: "Memory" - With Ashley, eliminated on the 6th card (tie-2nd/7). Redemption Island Ep. 12 duel: "Rock Block" - Appears to stop trying, is eliminated (4th/4). Redemption Island, Ep. 3: Russell Hantz (voted out, 3-3-3 [5-1-0 on re-vote]). Redemption Island, Ep. 5: Krista Klumpp (voted out, 6-2). Redemption Island, Ep. 6: Stephanie Valencia (voted out, 5-2). Redemption Island, Ep. 7: Sarita White (voted out, 4-2). Redemption Island, Ep. 5: Two votes, from Stephanie and Krista. Redemption Island, Ep. 8: One vote, from Matt. Redemption Island, Ep. 11 (F7 vote): Six votes, from Rob, Phillip, Natalie, Ashley, Andrea, and Grant (voted out, 6-1). Russell swears he's a changed man. We'll see about that. It's you or me, Steve. Or both. Rob Cesternino at RHAP (5/5/11): "No More Mr. Rice Guy: Talking to Survivor Steve"
Daniel Fienberg at HitFix.com (5/7/11): "Steve Wright talks Survivor: Redemption Island"
Patrick Gomez at People.com (5/8/11): "Steve Wright: Phillip Is 'Loony'"
"Personal Claim to Fame: Making the Dallas Cowboys with two other free agents out of 110 in 1981 and playing for 13 years. I'm also proud of my own start-up company and all it's accomplished. Pet Peeves: People who litter and people who don't respect others. Survivor Contestant You Are Most Like: Tom Westman - just a pretty normal likeable guy. 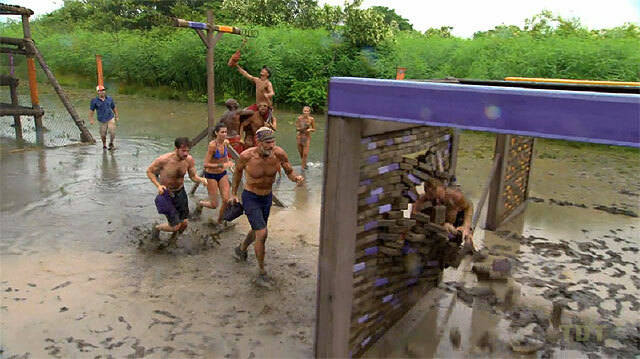 Why you think you'll "survive" Survivor: With 13 years experience in the NFL, I have great teamwork. I made sure we all worked together for a winning cause. I have the ability to keep spirits high and keep people's eye on our goal."